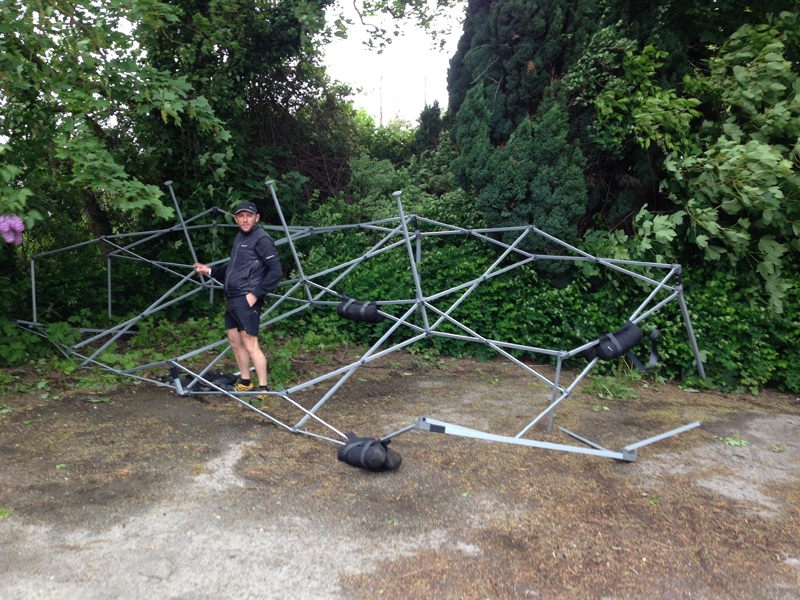 I arrived at the start to at (Radley Arms) in Oxford to find the gazebo which had been setup earlier in the day damaged by the strong winds. With the aid of a few of the runners,we tried to erect it again (fnar fnar) but to no avail as the frame was snapped and bent. We salvaged the canvass and spoke to the pub who kindly allowed us to their facilities which meant a tighter registration than planned but we were indoors and next to a bar, so all was not lost. Cliff King and I organised kit checks for the runners and we were soon working our way through the list of competitors which included several familiar faces. 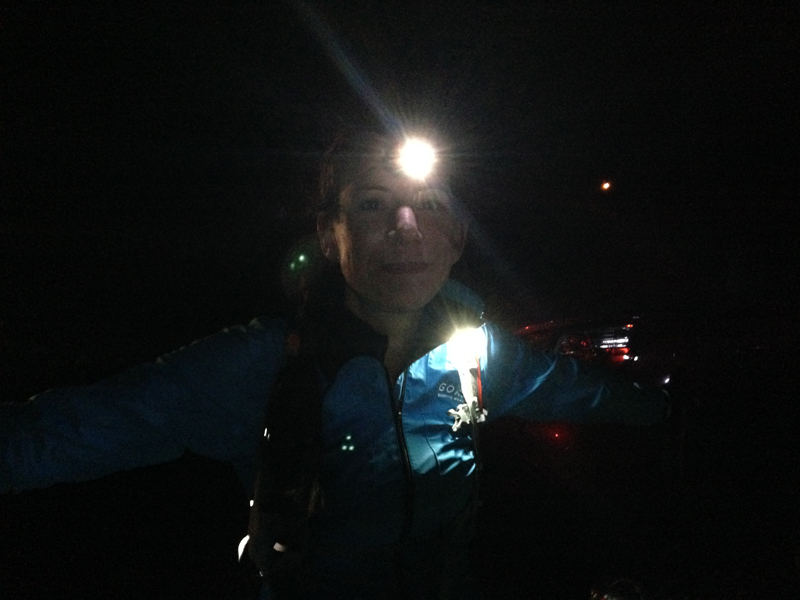 With a self sufficient over night run, it was important to ensure that all the runners were suitably prepared for the conditions with a waterproof, food, head torches etc. I was pleased to say that everyone turned up suitably prepared (some had elected to carry more kit to simulate heavier anticipated packs for the T184) for the event. A different feature of the race was the use of GPS technology to track each of the runners. I have been fortunate enough to test some of these devices having carried one at the Thames Ring and Spartathlon, so we were confident these would perform effectively but had yet to test multiple devices in use at the same time. For those who are interested, the race could be tracked from the GoTek 7 new app (iPads/iPhones) or from this weblink here. I have been loaned the use of this tracker for my upcoming races so if you want to see how slowly I’m moving at the GUCR then keep an eye on the weblink in a couple of weeks. 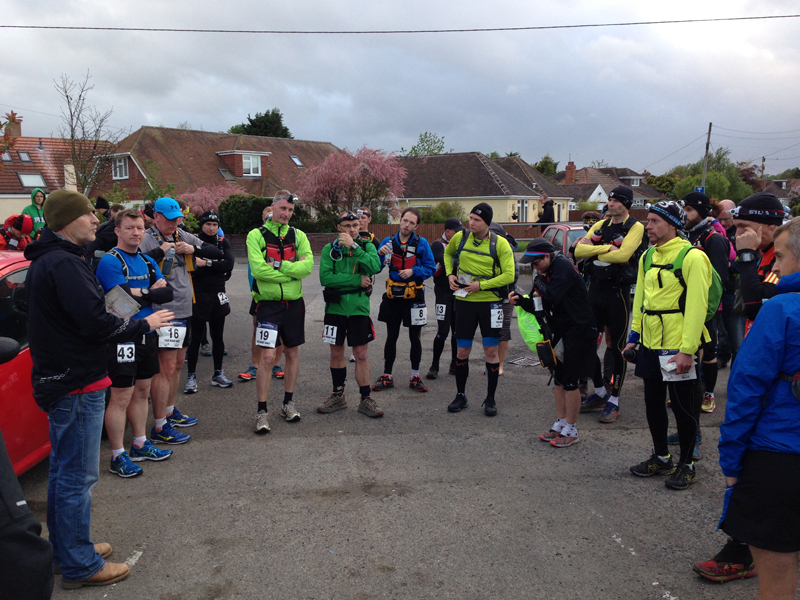 At 7.45, Shane from Running Reborn held the race briefing, ran through some last minute instructions and at 8pm promptly 35 runners headed off from the pub towards the river as it started to rain very lightly. A group of us headed to Checkpoint 1 at Pinkhill Lock where another gazebo had been setup earlier in the day. Unfortunately, this had also been trashed by the fierce winds earlier in the day and so we reverted to a contingency location of a layby on the road a few hundred yards ahead which the runners had to cross which meant the Marshals could shelter in their cars whilst waiting for the runners. We arrived at the Checkpoint an hour before the first runner was due and it took us about 30 seconds to get the water bottles setup and about 5 minutes to get the kettle on and we were good to go. Normally, there is this expectant wait for the first runner but as we had the GPS technology we watched the runners approach us. From a race organisation perspective this was superb. Shane had a nominated someone (Matt) to operate from home overnight on the PC acting as a virtual control centre and watching the race unfold live. This paid dividends almost immediately when Matt called me to say the Sweeper was ahead of the last runner who had appeared to go off course. I made a quick call to the Sweeper (Cliff) who backtracked a few hundred yards and met the last person and got them back on track within about 5 minutes. We followed the tracking until the first runners were almost on top of us and we seen had handful of runners coming through in 1’s and 2’s and small groups. Manning the checkpoint was simple and quick as the rules of the race meant we could only offer them water and most of the runners topped up their supplies grabbed a snack from their packs and then headed on. We closed the checkpoint at 11pm ish when the last runners was through and I headed home for a few hours sleep before returning early the next morning to complete some sweeping duties on the last leg. The weather had been a little cold and wet overnight so a tough night for competitors. I spoke to the Shane as I drove to the final checkpoint the next day who briefed me on the latest position with the lead guys just about to finish and a few people having dropped during the night. Most people had commented that the race was a lot tougher than they had expected with some of the trails being a little rural coupled with battling through the darkness, wind and rain. Sounded like a tough night for the runners. I had planned to camp at the end and then head back to the last Checkpoint but glad I made the decision to drive home which meant less sleep time wise but more comfortable conditions. Once again, the GPS technology was praised when a runner called to drop out unsure where they were and a quick call to the RD resolved the situation by checking their location and saying “Turn around, Head through 2 fields and we will collect you there”. This level of backup provides real confidence to the runners for an event of this nature. 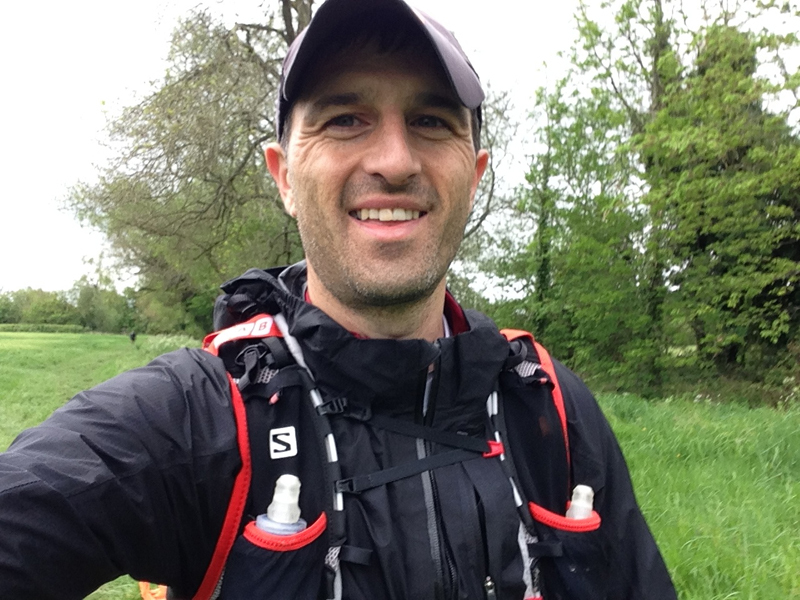 I arrived at the final checkpoint the next morning to see the last runner leave and decided to wait a little while before leaving to collect the route markings and sweep the course. I spoke briefly to Paul Coker and Cliff King who had been manning the checkpoint before heading out collecting the trail markings and any rubbish (and I didn’t spot any rubbish so well done everyone for not littering). It only took me a couple of miles to catch up with the last man, Mark who was struggling a bit with an ankle injury, blistered feet and a lack of sleep. I employed various tactics to try and keep the pace up and eventually found the best method was to march ahead and get him to follow but after a while it became clear Mark wasn’t going to make the end cut off time. There were one or two moments when he thought about throwing in the towel but I wasn’t really prepared to accept this and thought it better to finish the distance out of time rather than not finish the distance and tried to persuade him to carry on. Some pleasant conditions.. the next day! 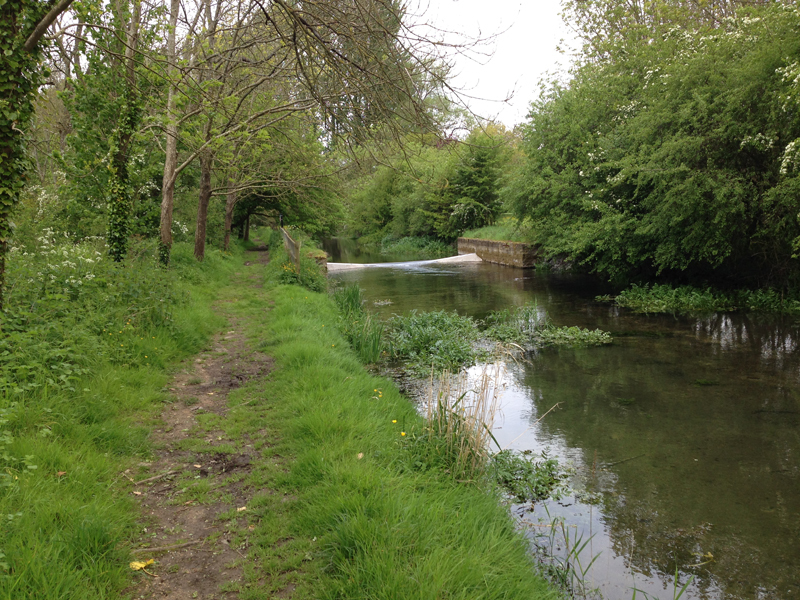 Some of the final stretch of the route was very scenic and picturesque as we followed wooded paths, farms and rural trails. The markings were pretty straight forward to follow in the light although the supplied maps could be made larger and clearer and the RD has already taken this onboard for future events. Having said that, it could have been a totally different proposition in the dark so I had the route plugged into my Garmin and followed the line and path quite easily apart from one minor diversion where we crossed a small bridge at a Farm rather than continue past it but this was soon corrected. To be fair to Mark, despite one or two moments he kept plugging away, tried to jog a few times but kept moving forward. The one drawback to use of a GPS device was the 53 phone calls he made to his wife asking “How far have I travelled?” over and over and over again! 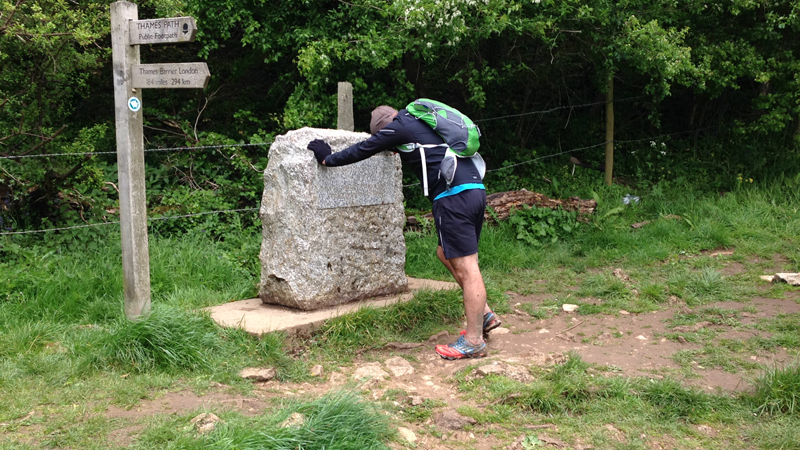 We finished over the final cut off (it took us over 5 hours to cover 17 miles in the end) but Shane recognising his efforts at the end gave him a medal for completing the distance after he touched the Stone Marker which marked the source of the Thames. 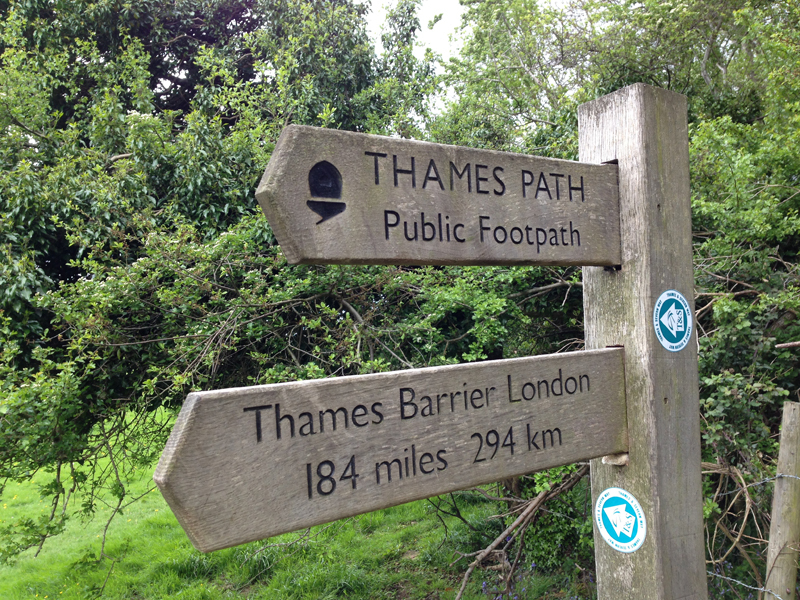 We then made the short walk to the Thames Head pub which was the base of operations to enjoy a well deserved drink before heading home and this was where I heard about the rest of the race. The finish for first place was close with Ollie Stotten narrowly finishing ahead of the second runner who closed a gap of a couple of miles in the last hour. It was a thrilling finish at the end with the marshalls gripped to the GPS devices watching events unfold before seeing runners coming into the final field at the end. Congratulations to Sharon Walton who was the 1st Lady home in around 14hrs. Out of 35 starters there were 25 finishers (71% finish rate). Reports from the crew suggested everyone found it pretty tough at night with the cold, wet and ground conditions. Some commented that they should have carried a bit more food so perhaps a few lessons were learned for the T184 A 15hr cut of time for a 60 mile race looks generous on paper but accepting the nature of the trail in parts and most of the race is at night meant quite a few people were running close to the cut off’s which added some extra tension and nerves to the event. The GPS technology worked brilliantly, with the race trackable online and this will be a key feature of the T184 race in August which I’m pretty excited about seeing in action on a long event over a few days. We’ve started to see this creeping into Ultra races more and more with The Spine and The Oner using this in their events recently and it certainly adds an extra dimension to the race and gives the internet audience (be it family, friends or those interested in the race) some real insight into people’s progress. I can genuinely see this becoming a standard feature of Ultra races in the future as the cost of this technology comes down in price. Well done to the Running Reborn team on a successful first event and well done to all the other volunteers for helping out. Congratulations to all the runners who took part in the event, it’s a tough little run but good preparation for the worst conditions the T184 could throw at you. After crewing late into the night, a few hours sleep and then sweeping the next day I was feeling pretty tired that afternoon so the majority of runners who made it to the end, gave a pretty solid effort. Thanks to Shane and all the team for a fantastic inaugural race. It was my 2nd ultra and despite the headwind, cold, nettle stings and muddy terrain it was a fantastic experience. Lots of times when I thought I would not make it ( especially when my usual running mate Andrew dropped out). 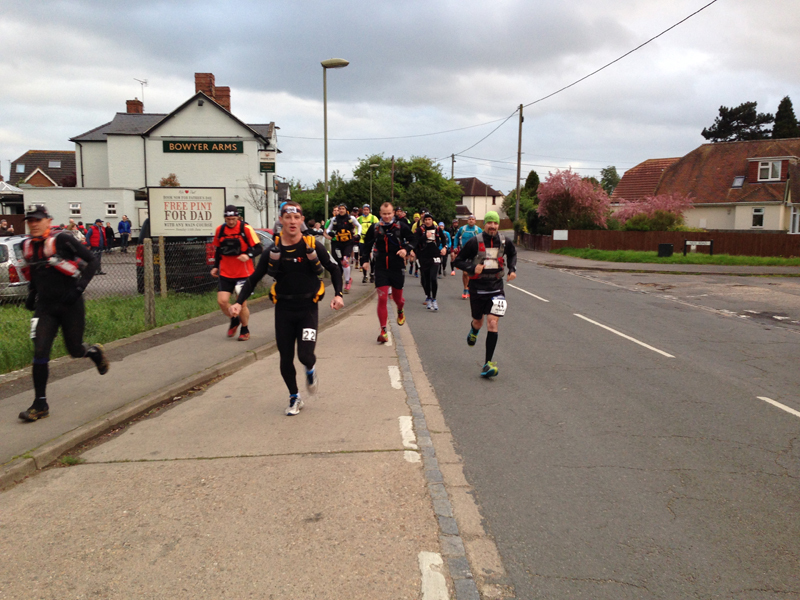 Great to here about Mark – a ran with him from 31- 34 miles . So pleased to hear about how he finished.There was some great camaraderie out there. 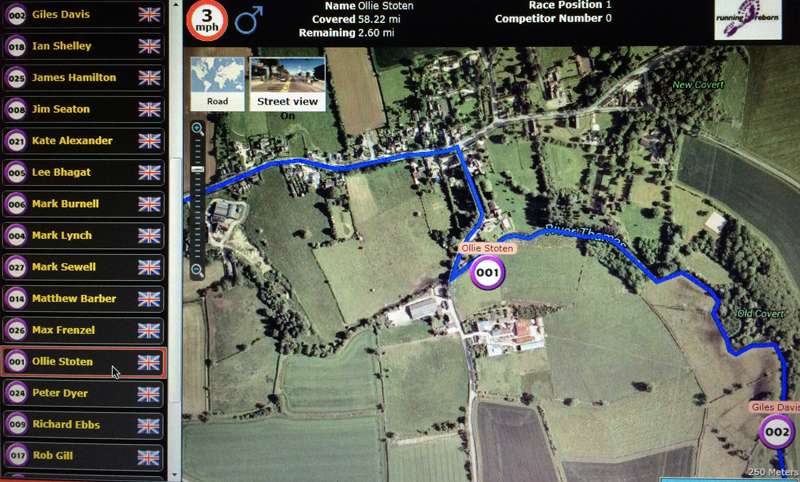 The tracker system was amazing as family and friends were gripped following my progress throughout the night.